I am having such a good time with art journal pages. Unstructured and flying free, people! After dividing the page with straight lines, I had smaller individual panes to work with. This took off a bit of pressure, and allowed my imagination to wonder what could live within the boundaries of those shapes. I rubbed Inktense blocks inside a couple of them, and found in the rubbings the boat in the lower left, the goose in the upper right, and the floral/plant shapes along the left side. The rest was just doodles, patterns, and colors to fall in with the teal theme I chose for the letter T. The piece of paper towel I used to blot the Inktense heart (top left) was used to make the heart motif under Jasper’s right wing. A little gesso “glued” it to the page, and provided some needed texture. I tried to leave large areas of white for the eye to rest as well. I like the way Jasper breaks outside the pane boundaries. “Let it tell you what comes next” – and have fun. Very inspiring, indeed. Very creative journal page, I like it very much. Oh Laura! I adore this!!!! I love the peaceful colors that speak to me at this time. This might be one of my favorite pieces of yours!!! Keep on keepin on! 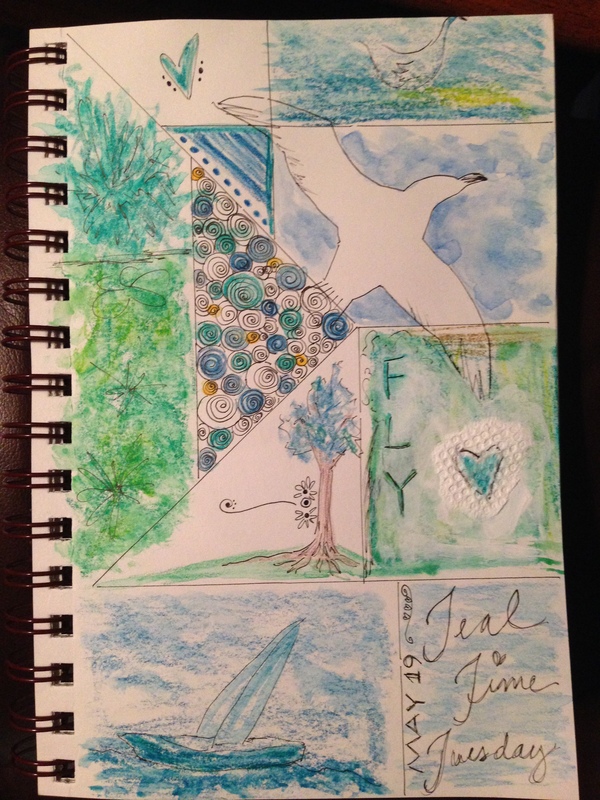 Good morning Laura – Very cool, filling your journals with your joy for creating art is inspiring us all. I enjoy reading your upbeat posts! I also like using the intense blocks. The colors are so rich. Have a super day! I’m getting inspired. I definitely want to keep a journal after my year of daily drawings. And what a cool way to mark a day, or even vent in color. Thanks, Jill! So glad to be inspiring you too, since you’ve inspired me countless times with your artwork! Good for you in breaking up the page into something other than just rectangles! And then breaking through your “boundaries” with Jasper. I can tell it was fun for you. OK, even before you told us to be inspired, I remembered your “How to Draw Birds” tutorial, and tried to draw a bird myself. I had to make one up because I had no idea on the head shape for any bird I could think of, so I created one that reminded me of a Bird of Paradise type bird. Hopefully I’ll post it soon. Then I made up a Jay-type bird, and then I copied a hummingbird pictures from my field guide. They all turned out surprisingly well, so thanks for your encouragement! I am now thinking of starting an art journal. Wish me luck! This is such a fun idea. I will have to try it. I am feeling inspired by your post! Yay, Cathy!! A (hopefully) cooler one should be rolling out in the morning. I hope you enjoy! I can tell your having fun! looks great!! This is definitely a quilt. Ok now I’m really thinking. Two votes for a quilt! This is cool. Thank you!